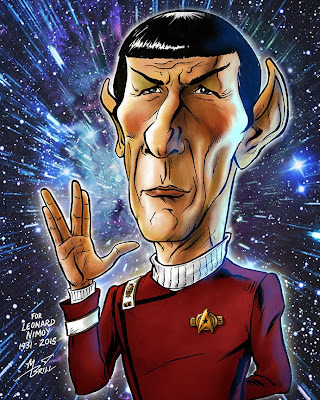 I met Leonard Nimoy one time, at a comic convention, with about 10,000 other Star Trek fans--but it was wonderful. I made him smile as I tried to decide which photo to have signed. He let me shake his hand. It was a mere moment in his world, but it was the culmination of 40-odd years of mine! As I got older I grew to appreciate the qualities of Leonard Nimoy, the actor/director/photographer, etc as much as I appreciated and admired Mr. Spock, the beloved childhood hero. He was an amazing talent and a genuinely good person--as good a human being as his alter ego was a Vulcan! In any case, I'm grateful I got to enter his orbit, even if only for that small moment. Normally, I would have wanted to do a more serious portrait, trying to pour a whole life of joy and somber appreciation into it after his passing. But I am on a caricature bent at the moment and I think he would have enjoyed this small tribute. He was a generous spirit full of good humor. I like to think it would have made him smile again for me. Rest In Peace, Mr. Nimoy! You did indeed live long and prosper.